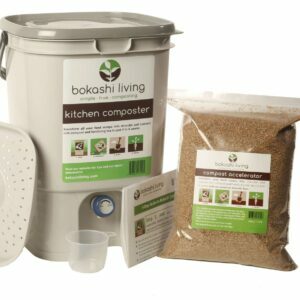 Can I Bokashi Compost my dog waste? FAQs › Can I Bokashi Compost my dog waste? Yes, but its best to be treated separately and we wouldn’t recommend simply adding it to your existing bin along with your food waste. The bokashi fermentation process helps to kill pathogens in the waste. You have a couple of different options: Some people simply use a regular bokashi bucket (exclusively for pet waste) and follow much the same approach as for fermenting food waste. Add your waste (ideally unbagged), sprinkle with bran and repeat until the bokashi composter is full. Then leave to ferment for a couple of weeks and dig it into your soil. It depends how strong your stomach is and whether you like the idea of emptying and digging in a bucket full of fermented pet waste! It is possible to buy pet waste composters, but you can make your own. Find a 5 gallon (or larger) bucket with a well sealing lid. Cut the bottom of the bucket and bury it almost entirely in your garden (away from any places that you grow vegetables and/or children/pets may play). Put your pet waste into this container (ideally unbagged) and sprinkle with bokashi. Repeat. The life in your soil will do most of the work so that you can keep adding pet waste on the top and you should see the level continuously going down. If you should fill your container, then pull it out of the ground (leaving the fermented waste behind) and relocate. Cover the initial area with at least 6 inches of soil. 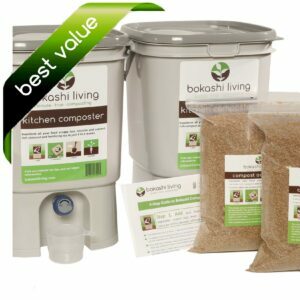 Note that although the bokashi composting process will help to kill the harmful pathogens found in pet waste, it is recommended that you bury the fermented pet waste at least 2m from any areas where you grow fruits or veggies.